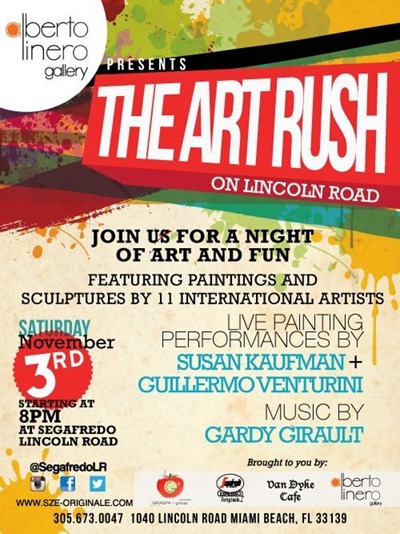 This will be an eclectic art experience YOU CAN’T MISS at Segafredo Lincoln Road! Segafredo on Lincoln Road, also referred to as Lâ€™Originale, has partnered with Alberto Linero Gallery to showcase celebrated local and international artists and their mixed media works including sculptures and paintings. The monthly series second event will be held on Saturday November 3rd at 8pm and will be held every first Saturday of the month through January 2013. In November, selected artists are Santiago Betancur, Todd Babb, Luis Jimenez, Sarah Allen, ROMGO, Pedro Sandoval, Dario, Breceda, Gabi Correa and Fred. In addition, a live painting performance by Susan Kaufman and Guillermo Venturini will be held throughout the evening. The line- up of international artists bring an eclectic art experience with inspirational creativity from science with life-size figure painting by Betancur; urban living, with steel sculptures by Luis Jimenez; natureâ€™s destruction by Sarah Allen; natural elements, light and colors by ROMGO and abstract neo-expressionnism by world-renowned Sandoval. Live performers Susan Kaufman and Guillermo Venturini will explore their environment and release their inspirations onto their canvases. Located in the lively pedestrian street, Segafredo Lâ€™Originale on Lincoln Road offers an open air setting for viewing unique pieces of art by talented international artists otherwise only available in a gallery environment. Each artist will be on site to discuss their pieces with inquiring minds during ART RUSH. â€œART RUSH was designed to engage patrons and passing visitors into an art-based experience where the art comes alive before you,â€ explains Alberto Linero of Alberto Linero Gallery. Gardy Girault will be spinning his tunes during the event. For Luis Jimenez, inspiration can develop from everyday activities such as a drive to the office or even watching television; beauty can present itself as a sign on Lincoln Road (Miami Beach) or in a piece of twisted metal in New York City. The combination of this daily urban alphabet guides his creative sensibilities and challenges cultural barriers. A New Jersey native, Jimenez moved to Colombia where he pursued a degree in mechanical engineering at Medellinâ€™s School of Administration, Finances and Technology. He thereafter continued his education at Florida International University in Miami with a specialization in laminated steels, which led to an early career in the metal and mechanical industry. Jimenez ultimately discovered plastic art through his work in the metal industry. He explored the medium during workshops and personalized courses in drawing, painting, wood sculpture and stained glass, both in Colombia and United States. He continues to perfect his craft at Alberto Linero Gallery in Miamiâ€™s Wynwood Design District, where he is an artist-in-residence. Jimenezâ€™s iconic â€˜Peaceâ€™ sculpture is installed in front of Mai Tardi Restaurant in the Design District and at the Philharmonic Center for the Arts in Naples, Florida. A natural ability to sculpt and paint was fine tuned during the prosperous years of Toddâ€™s first business venture, Creative Artistry. During this time he carved and painted in solid surface materials working directly with design professionals on three continents. His work with Dupont CorianÂ© and LG HiMaxÂ© gave him an audience with such industry giants as Princess CruiselinesÂ© and the Walt Disney CompanyÂ©. This success also afforded him the opportunity to show work in Solid Surface magazine, on Home and Garden Television, and in events such as the Kitchen and Bath International Showâ€™s in Atlanta, Chicago, and Orlando. While pursuing these endeavors he continued to give back to the community with involvement in local charities in Southwest Florida, such as Arts for ACT and Pelicans in Paradise. Todd was also honored to work in a sole artist project with Lt. Governor and Mrs. Jeff Kottkamp to raise money for the Abuse Counseling and Treatment Center. Since 2007 Toddâ€™s focus is exclusively on fine art using his personally developed method to create conceptual pieces that portray a deeper understanding of human nature. His sculpture has been on display at the Naples Museum of Art and in solo and group exhibitions. His work can be seen in galleries, fine art festivals, and collections around the world, ranging from Panama and Ecuador to Greece and the United Kingdom. His work has also been featured in numerous articles and publications (to include the 81st edition of Florida Architecture). The work of Santiago Betancur lies between the complexity of science and abstract art. His approach to life-size figure painting interweaves the two worlds, creating a delicate balance that gives him â€œthe satisfaction of discovering [his] own abstract diseases and cures.â€ His style reflects his affinity for nature and for how natural elements emit the highest level of creativity. A native of Colombia, Betancur traveled to Miami in 2009 with a goal to generate new concepts for how humanity views itself. His work is physiologically precise, often gaining praise from doctors and scientists. Mexican Artist, ROMGO is famous for his â€œycaros.â€- They are imaginary beings in a million different colors and forms. They roam freely in each of Romgoâ€™s pieces, and cohabit the walls of his studio, going up and down the stairs of the imagination. They weave neuron thoughts of creative ROMGIANA. They go out and expose this creativity to the light and they bathe in the color and textures. They are hiding in each grain of sand mixed in his work. Pedro Sandoval defines himself as abstract neo-expressionistic, which inevitably puts him together with Kandinsky and Willem De Kooning, whose vibrant influence is felt in his work. However, a simple retrospective look will allow us to determine that his artistic path cannot be laced in simple classifications. Sandoval is much more. His work feeds on the rich source of abstract painters who preceded him and left magnificent works. Today, he is considered as one of the most important artists of the world of painting. The works of Pedro Sandoval are part of the Moma- Museum of Modern Art, Louvre, Muse de Orsay, Centre Pompidou, Guggenhei â€“ New York, Guggenheim-Bilbao, Guggenheim-Berlin, The Metropolitan Museum of Art New York, Museo Nacional de Arte Moderno â€“ Tokyo, Museo del Prado in Madrid, J. Paul Getty Center- Los Angeles, TATE â€“ British and International Modern Contemporary Art, Centro de Arte â€“ Reina Sofia, Museo Thyssen Bornemisza, Boca Raton Museum of Art in Mizner, Museo de Arte Contemporaneoâ€“Barcelona Hamburger Kunsthalle â€“ Germany,Museo Nacional de Arte Decorativo â€“ Argentina, Museo de Arte de Sao Pablo â€“ Brazil, Museo de Arte Moderna de Rio de Janeiro, Galeria Nacional de Arte â€“Washington, Galeria Nacional de Londres â€“ Great British. Moreover, his works are present in private collections around the world, like the Kennedy family, the Collection of the White House and Vatican Museum Collection, among others. Susan defines herself through color and movement. Her work with oils; acrylics and mixed media explore the limits of abstract and expressionist art through passionate brush strokes drenched in bold hues. Her paintings draw on intense personal experiences as a martial artist, private pilot, dancer, extensive United States and foreign travel, and music, which moves her soul. She is inspired by nature and all living beings in the Universe. Each blank canvas is just waiting for her to create a link between her soul and all that view her art. While living in California, Susan painted and exhibited in Juried Art Shows at the Pacific Art League in Palo Alto , California as well as exhibits in community sites in the Bay area. After moving to Miami Beach, Susan continued to paint at the Art Center of South Florida and then at the Bakehouse Art Complex in Miamiâ€˜s Wynwood Art District. At the BAC her work was juried and she was accepted as a resident artist and worked there for four years. She now paints in her home in Sunny Isles Beach, Florida and in Manhattan. Creative, self-taught, began in photography in 1977 at Centro de Ensenanza de la Imagen, Madrid, Spain. Professor of Photography Digital University of Flores-Argentina.